I created this page because the same few questions keep coming up over and over again in discussion forums, and it would be useful to have answers together in one place. In addition, as a Canadian I feel bad for travellers suffering through what was once one of the easiest border crossings in the world. Sorry, eh! First, a caveat: I am not a lawyer, and I don’t work for Citizenship and Immigration Canada, the Canada Border Services Agency, or any other government agency responsible for the new Electronic Travel Authorization (eTA). Nor, for that matter, am I in any way connected to any of the “agencies” which have sprung up online to assist with the eTA application process. However, as an active member of a few online travel forums, and a travel blogger and writer, I find myself being inexorably pulled into – sometimes heated – discussions on Canada’s newest entry requirement. So this FAQ brings together the best understanding based on personal experience, first-hand accounts, and research from government and other sources. Unfortunately, there seems to be a lot of confusion, misinformation, and strongly felt but misguided opinion about the eTA, amongst would-be travellers to Canada – and sometimes the well-meaning people who try to help them. These problems are compounded by some confusing word choices in official government sources, chiefly from Citizenship and Immigration Canada. The recently announced leniency period, while it should have resolved these issues at least in the short term, has often just added to the confusion by introducing another level of complexity. Here, I will attempt to offer as best I can my understanding of the eTA as it develops. Please note that this page is a work in progress: I will do my best to tell you what I know, and where practical will include sources of information. My understanding will change as new information and first-hand accounts become available. Finally, as your teachers told you in school, don’t believe everything you read – especially online, always check the sources yourself! Also, a request: please feel free to share your own research and personal experiences in the Comments space, so that others can benefit. However, this is not the place to ask questions related to your eTA application: discussion forums such as Thorn Tree and, in particular, the Canada forum at TripAdvisor are already full of threads on precisely this topic. I will structure this information based on generic questions which address the topics which seem to be coming up most frequently online. Discussion forums are full of rip-off stories and hassles. Check out this thread, for example, on TripAdvisor: https://www.tripadvisor.com/ShowTopic-g153339-i49-k9522033-Canadian_eta_beware_of_scams-Canada.html. As I noted, government of Canada websites end with .gc.ca. Anything else, especially .com, and it’s not an official government site but something else – such as a profit-making company. For the record, the cost of an eTA application directly through the government website is $7. ‘Nuff said. I hope… Here’s the URL for the government’s site with a link to the TA application page, amonf other resources on the eTA http://www.cic.gc.ca/english/visit/eta.asp If you’re wondering, the “cic” in this case means Citizenship and Immigration Canada, a department of the federal government. The official word from CIC is “yes,” but it will be very interesting to hear any first-hand reports from travellers who arrive without having started the application process. Please add your experience in the comments below! Yes, visa-exempt foreign nationals are expected to have an eTA to fly to or transit through Canada. However, until September 29, 2016, you can board your flight without an eTA, as long as you have appropriate travel documents such as a valid passport. During this leniency period, border services officers can let you enter the country as long as you meet the other requirements to enter Canada. Before you travel to Canada—even if it is when you check in for your flight—you can apply for an eTA using any device with an internet connection, including a mobile phone. It takes just a few minutes to complete the form. All you need to apply is a passport, a credit card, and an email address. In most cases, the eTA will be granted within minutes of applying and will be electronically linked to your passport. Once approved, an eTA is valid for five years, or until your passport expires, whichever comes first. You can make multiple visits to Canada with a valid eTA. It is best to get an eTA as soon as possible. Unfortunately, this explanation, like several others connected to the eTA, uses ambiguous language: What does it mean, exactly, to say that travellers are “expected” to have an etA, even during the leniency period? If it is essential to at least start the application process before arriving in Canada, why not simply say so? For example, the same condition could be spelled out more clearly by stating “Yes, visa-exempt foreign nationals must have applied for an eTA to fly to or transit through Canada.” Here, as on some other pages, ambiguous word choice is creating confusion about what is required of travllers during the leniency period. This is one of the most variable, and therefore frustrating aspects of the experience for travellers. CIC claims a turnaround time of “a confirmation within minutes” in “most cases” (http://www.cic.gc.ca/english/helpcentre/answer.asp?qnum=1063&top=16). In other cases, such as when additional documentation is required, you should expect an email with next steps within 72 hours (http://www.cic.gc.ca/english/helpcentre/answer.asp?qnum=1084&top=16). However, the actual processing time seems to vary widely: on this discussion thread on TripAdvisor “(eTA Application” https://www.tripadvisor.com/ShowTopic-g153339-i49-k9318890-o110-ETA_Application-Canada.html) some applicants are reporting wait times of a few weeks to as long as a month – though ultimately successful! When a third-country national applies to Canada for a visa or a permit, or claims asylum, Canada will send an automated request for data to the United States. The request will contain limited information, such as name and date of birth in the case of biographic sharing, or an anonymous fingerprint in the case of biometric sharing. If the identity matches that on a previous application, immigration information may be shared, such as whether the person has previously been refused a visa or removed from the other country. All information shared as part of the initial request will be automatically purged from U.S. systems regardless of whether a match has been found. The same process would apply in reverse when a third-country national applies to the U.S. for a visa or claims asylum. “If your application was refused, you should not plan or undertake any travel to Canada, even during the leniency period. If you decide to travel to Canada with a refused eTA during the leniency period, you may experience delays or be prevented from entering the country. That “may experience delays” at first sounds encouraging, but I wouldn’t want to arrive just to be turned back at the border. Under the circumstances, I would not travel to Canada during the leniency period if my application were refused unless it were a dire emergency: a serious family crisis or the like. Just my toonie. Travel discussion forums have lit up with the topic of the eTA, especially as frustrated and confused travellers have started to run into problems with the application process. Two discussion forums which I participate in and have threads on the eTA are Lonely Planet’s Thorn Tree, and TripAdvisor. Lonely Planet Thorn Tree Canada Forum https://www.lonelyplanet.com/thorntree/forums/americas-canada/canada has some discussion on specific aspects of the eTA application process, such as on paying fees and juggling passports for dual citizens. TripAdvisor’s Canada Travel Forum https://www.tripadvisor.com/ShowForum-g153339-i49-Canada.html has been extremely active on the subject of the eTA, and continues to have several threads with sometimes quite heated exchanges on many aspects of the eTA. There’s some useful information here, from people who have researched the topic as well as from – a hopefully growing number of – people who have shared their first-hand experience. Toronto has changed a lot in the 46 years since we moved here, especially (the lack of) affordable housing. Back in 1968 when we emigrated to Canada from the US, Toronto was a very different place from the big, bustling, cosmopolitan, and multicultural city it is today. As my Ma — a Chicago girl born and bred — likes to tell it, the first Sunday she went “downtown” (to the current site of the Eaton Centre and Dundas Square) “it was so empty you could roll a bowling ball down the sidewalk without hitting anyone. When I finally found someone to ask where “downtown” was, she just looked at me and said “This IS downtown!” (thanks for the anecdote, Ma!). Even if T.O. Hadn’t introduced Sunday shopping back in the early 90’s, downtown now would still be nothing like downtown then. Condos continue to be thrown up faster than beavers build dams in flood season, so there’s a lot more people on the streets now than then. Immigration has also changed dramatically since then, as Edward Relph’s website, an online companion to his new book Toronto Transforms, maps out. 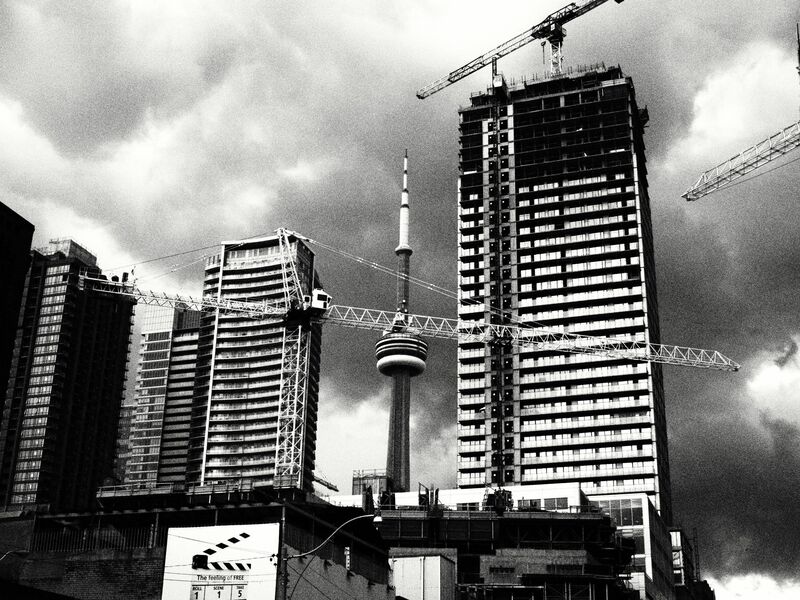 Finally, and this is probably old news to most of us by now, Toronto’s housing costs continue to boom and boom and boom: according to this Toronto Real Estate Board website, in 1967 almost 12,500 houses were sold in the city for an average price of $24,000; in 2012 it was almost 86,000 houses at an average price of nearly $500,000 (still well behind Vancouver, Canada’s most expensive city).